The Clermont County Common Pleas Court is providing this glossary to you as a basic description of some of the legal terms you will hear before and during your jury service. This is only for orientation purposes. This is not a substitute for the specific information you will be given by the Judges and the Court staff during your service. Jury duty—The legal obligation of a citizen to come to a trial court to be available as a potential juror (either as a grand juror or a petit juror), and hear, if selected as a juror, criminal and civil cases. Petit Jury—The jury in the trial of a case, whether it is criminal or civil. A trial court jury decides, after hearing all the evidence, whether one party owes something to another (a civil case), or whether a Defendant is guilty or not guilty of a crime (a criminal case.) In Clermont County, jury duty can last as little as one week, or for the duration of one trial. Summons—A legal document issued by a clerk of courts informing an individual that they must appear in court for a particular purpose. A resident of Clermont County called for jury duty will receive a jury summons in the mail. A jury summons covers a span of time for an individual’s jury service, not a particular case. Case and courtroom assignments are done on a daily basis during a person’s jury service. Common Pleas Court—The general jurisdiction trial court in Ohio, which handles bigger civil cases, adult felony crimes, and all other cases not handled by another, more specialized court. The Jury Manager assigns jurors for both Common Pleas and Municipal Courts. The Jury Assembly Room is located in the Common Pleas Courthouse, 270 East Main Street, Batavia. Municipal Court—A trial court with jurisdiction to handle traffic and misdemeanor cases, and civil cases under $15,000. The Jury Manager assigns jurors for both Common Pleas and Municipal Courts. Jurors assigned to Municipal Court cases have a separate Assembly Room in the Municipal Court, 4430 State Route 222, Batavia. Bailiff—A court officer who assists a judge with scheduling, jurors, court proceedings, paperwork, etc. The bailiff is the officer who assists the jurors in the performance of their duties, and acts as a liaison between the court and the jury. Voir Dire—The question and answer process at the start of any trial where the judge and the attorneys ask questions of the prospective jurors to make sure they can be neutral and impartial in a particular case. Voir dire, which is like a job interview, is conducted under oath in the courtroom. Plaintiff—A person, corporation, or other entity that starts a civil court case by filing a complaint, setting out their legal claims for recovery against one or more Defendants. Prospective jurors are likely to be asked in voir dire if they personally know the Plaintiff and the Defendant. Defendant—A person, corporation, or other entity subject to the legal claims of another (called the plaintiff) in a civil lawsuit. Prospective jurors are likely to be asked in voir dire if they personally know the Plaintiff and the Defendant. The person accused of a crime in a criminal case is also a Defendant. Jury Panel—A group of prospective jurors who are drawn from the Jury Assembly Room to go to a courtroom for the start of the voir dire process. Not all jurors in a panel will be selected to serve on a particular case. Jurors who are not needed on a case are returned to the Jury Assembly Room for possible further service. Seated Jury—The particular jurors who have been selected from the jury panel through the voir dire process to hear and decide a case. The jurors who will hear the trial (both regular and alternates) are given an oath at the end of the voir dire to make their status as jurors official. Admonition—A specific set of legal instructions given by the trial judge as a standing order to a seated jury at the very start of a trial. The instructions given in the admonition cover what seated jurors can and cannot do while they are serving on that jury. It is typical that jurors are ordered not to talk about or discuss the case, not to have contact with anyone participating in the trial, and not to allow outside factors to affect their neutrality in the trial. It is vital that jurors listen carefully to the admonition from the judge and obey all the instructions throughout the trial. Jury Assembly Room—The designated room in the Common Pleas Courthouse where prospective jurors meet for their first day orientation, wait for assignments before the start of trials, and, if seated, wait during recesses in an on-going trial. 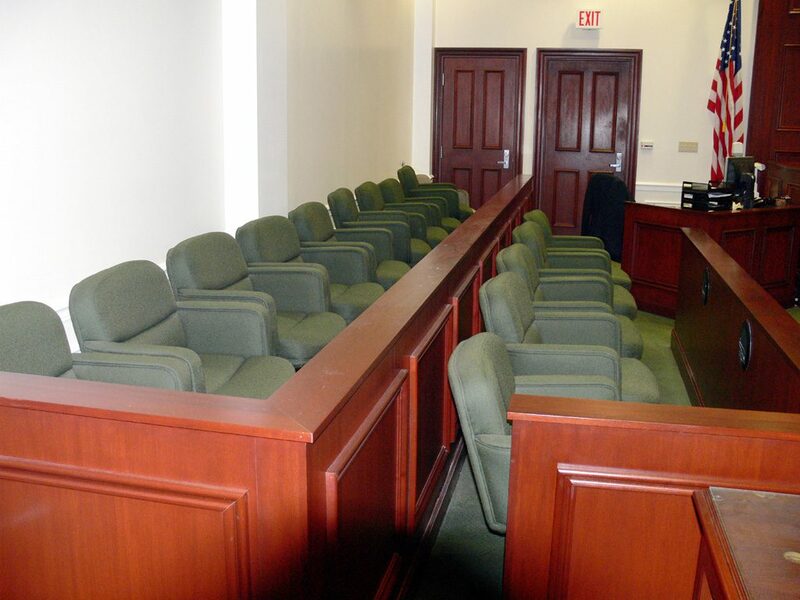 Jury Box—The designated, separate area of the courtroom where the jurors sit during court proceedings. Jury Deliberation Room (or just Jury Room)—A private room adjacent to the courtroom reserved only for jurors. Jurors may use the jury room during breaks in the trial. Most importantly, the jurors conduct their private deliberations in the jury room to reach a verdict at the end of a trial. This glossary is only for orientation purposes. This is not a substitute for the specific information you will be given by the Judges and the Court staff during your service.